Recognizing the need for the collaboration and continuing education of physicians practicing ringside medicine throughout the United States, Dr. Michael Schwartz of Darian, Connecticut and others established the American Association of Professional Ringside Physicians (AAPRP) in 1997. The goal was to more effectively protect and enhance the health, safety, and welfare of professional boxers. Develop and effectuate the “Gold Standards” applicable to the multi-faceted aspects of ringside medicine. The ARP membership encompasses not only physicians but also fighters, members of governmental boxing commissions, sanctioning bodies, promoters, trainers, medical students, paramedics and EMTs, and others involved in providing for the health, safety, and welfare of those participating in both amateur and professional combat sports.. Accordingly, toward the ultimate ends of uniformity and effective enforcement of medical standards in ringside medicine throughout the world, the ARP gratuitously offers its services to all – inclusively, not exclusively. Among its many activities and initiatives, the ARP conducts an annual two- to three-day medical conference. Experts in their particular fields of ringside medicine and other related subjects present an array of highly relevant topics, with Q&A from attendees following each presentation. For example, in past conferences members of the NFL Brain Study presented their findings regarding Chronic Traumatic Encephalopathy; neurologists and neurosurgeons debated the propriety of licensing a fighter who had suffered a subdural hematoma; and special guest presenters included Bernard Hopkins, Emanuel Steward, and MMA referee “Big John” McCarthy. Physicians attending the ARP’s annual medical conference earn CME’s accredited by Wake Forest University. In 2012, in conjunction with the American College of Sports Medicine, the ARP developed a psychometrically verifiable examination, which together with the satisfaction of other specified criteria, yields an ARP Certification deeming the physician qualified to practice ringside medicine. 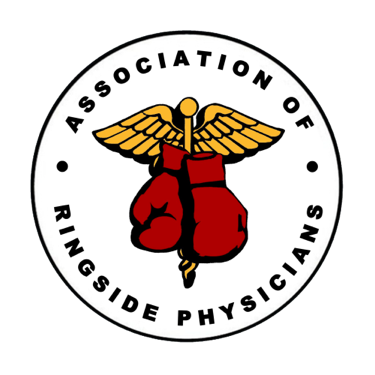 This Ringside Physician Certification Examination is administered worldwide, and the ARP maintains a published listing of certified ringside physicians. The ARP also periodically issues Consensus Statements regarding topics such as Medical Clearance of the Older Fighter, Testosterone Therapeutic Use Exemptions, Weight Management in Professional Combat Sports, and Blood-Bourne Infectious Disease Screening in Combat Sports. ARP Board member Dr. Rick Weinstein with former Champion Evander Holyfield.